AKA Maximilian Adalbert Baer, Jr.
Max Baer Jr earned a degree in Business Administration, but found acting an easier paycheck, and appeared in guest roles on such early-1960s staples as Maverick and Hawaiian Eye. 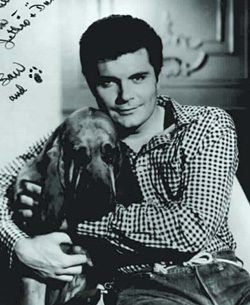 In 1962 he landed his name-making role as the comically dim Jethro Bodine on The Beverly Hillbillies, and by the time the series ended nine years later few producers could imagine him in any other role. After a few appearances on Love American Style, Baer wrote and produced the drive-in hit Macon County Line, starring himself and Leif Garrett. He directed three films in the 1970s, the broad, brawling comedy Wild McCullochs with Forrest Tucker, the adolescent tragedy Ode to Billy Joe with Robby Benson, and Hometown USA, an uninspired Southern-fried spin on American Graffiti. Baer then retired from show business, and has lived comfortably off his TV and movie residuals ever since. Since 2003 he has been trying to find backing to convert a closed Wal-Mart near Carson City into a Beverly Hillbillies-themed resort to be called Jethro's Beverly Hillbillies Mansion & Casino. Though funding has so far proven elusive, Baer's plans include Granny’s Vittles & Hog Jowls Coffee Shop, a bakery to be called Elly Mae's Buns, and Jethro's "All You Can Et" Buffet. Baer made news in 2005 when he publicly protested the way his father, world heavyweight champion boxer Max Baer, was portrayed in Ron Howard's boxing movie Cinderella Man, which made the elder Baer its bad guy, an ogre who laughed about killing two opponents in the ring. Baer, though, insists that his father had been deeply troubled by those deaths, and used his winnings to financially provide for the families of both his victims. Om 27 January 2008, Baer's live-in girlfriend, Chere Rhodes, shot herself in his Lake Tahoe home. She died three days later. NNDB MAPPER Create a map starting with Max Baer, Jr.